Due to a shortage of family physicians and a desire to expand alternatives to private family practices, in 2005 the provincial government announced the creation of family health teams (FHTs) that now serve 3 million Ontarians through 184 teams across the province. 74 new community health centre (CHC) sites have been created since that time that serve over 250,000 people with primary health care services . Primary health care can also be accessed through nurse practitioner- led clinics, solo primary health care physician practices, and community programs such as home care and long-term care facilities. There is a growing trend for community mental health and addictions agencies to work in partnership with family health teams and community health centres. FHTs and CHCs provide primary health care using a model of multidisciplinary care that includes physicians and other providers such as nurse practitioners, nurses, social workers and dietitians. In addition, CHCs provide a variety of health promotion and illness prevention services that focus on addressing and raising awareness of the broader social determinants of health, such as employment, education, environment, isolation, social exclusion and poverty. CHCs are designed to meet the specific needs of a defined community, often with a focus on groups of people who face particular barriers to health. FHTs are designed to give doctors support from other professionals in providing primary health care to the general population. CHCs are non-profit, community-governed organizations. Most FHTs are physician-led, although some are community-led. Access to primary health care is often an issue for people with mental illnesses or addictions. Individuals with mental health and addictions needs have difficulty accessing mental health and addictions services through their primary health care provider, and often have other health needs that may not be met if receiving care for a mental illnesses or addictions. We also know that individuals with mental illnesses and addictions are also more likely to have a co-occurring chronic health condition, making the need to ensure that a holistic approach to care is provided in primary health care settings for individuals with mental health and addictions needs. 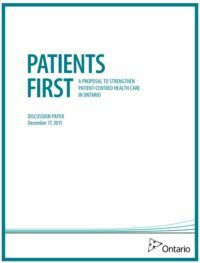 Most recently through Patients First: A Proposal to Strengthen Patient Centered Care in Ontario, the province has identified changes to the health care system that are intended to improve the fragmented, uncoordinated and inequitable service delivery challenges still facing the health care system in Ontario. A key area of focus for this proposal is the enhanced integration of primary health care with other health care sectors, including mental health and addictions. Ontario’s Mental Health and Addictions Leadership Advisory Council was named in the proposal to play a role in leading changes to the mental health and addictions system that will help achieve the integrated health care system vision outlined in the proposal to enhance access and improve overall system performance. The Council has struck a working group to explore how to strengthen the partnerships between the primary care sector and the mental health and addictions sector. Primary health care providers in Ontario play an important role in managing mental health and addictions within a broader system of community, hospital and specialized services. Individuals living with a mental health condition or an addiction turn to their primary health care providers for assessments, care, advice and referrals to other health care services, depending on their individual needs. However, little is known about how primary health care services interact with the broader mental health and addictions system, the capacity of the primary health care sector to provide mental health and addictions care to clients, or the ability of primary health care providers to leverage existing mental health and addictions resources that can enhance the quality of care for their clients. The Council is currently examining these systems issues and working towards effective solutions.